FULL TIMEThe Power put away another challenger as they beat the Dockers by 18 points, to go to a 7-1 record before the bye. The Power have this won, even if their was an element of doubt before, it has been extinguished now. GOAL DOCKERSClarke who has a shot from 55m out, it clears the pack and goes through for a goal. The margin is back to 18 points. The Power are away from half back as they deny the Dockers once again. 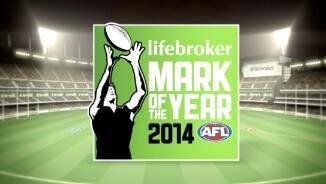 The Power take their position on top of the live AFL ladder with a win here today. BEHIND DOCKERSMundy gathers the spill of the ball, has a shot on goal and pushes it away to the left. Power InterchangeChad Wingard off due to an injury. The Power are icing the clock as they feel that they can defend their lead until the end of the game. There is still enough time left on the clock for the Dockers, but they need a couple of quick goals. GOAL DOCKERSFyfe comes out and takes the mark 45m from goal, he has the shot on goal and he finally breaks the duck for the Dockers in this final term. The margin is 25 points in favour of Port. BEHIND POWERWhite takes his opponents on, as he runs along the boundary, has a shot on goal and just pushes it away to the left. Ballantyne is down behind play after a head clash. He is being attended to by the trainers. GOAL POWERYoung marks 40m from goal, he takes the set shot on goal and he scores another Power goal. It is party time for the Power. What an amazing turnaround by Port Adelaide, as they have come out and kicked four goals to nil. GOAL POWERWingard marks the ball 35m from goal, directly in front. He kicks his fifth goal of the day, in his 50th game. BEHIND POWERThe ball is punched through for a rushed behind for the Power. Fremantle are defending hard as the Power can see the finish line approaching, with a victory in hand. BEHIND POWERMitchell gathers it inside 50, he has a shot on goal and misses. The challenge has been laid out to Fremantle, are they good enough to come back from the biggest margin of the game? GOAL POWERYoung finds Cornes and goes to him, as he offloads to Pittard, kicking the goal. The Power are surging! The Dockers must reply now, if they want to lay claim to winning the game, as the Power have the momentum. GOAL POWERWhite runs it down from the middle, he has Wingard in support if he wants him, he runs it down to inside 50 and he drills it. The Power lead by 10 points. Johnson stands up high and takes the mark in the last line of defence, as the Dockers look to reload. BEHIND POWERThe ball comes off hands and through for a rushed behind it goes through for the Power. BEHIND POWERWingard once again finds some room and takes a mark in the pocket. He takes the shot at goal, but it never looked likely. BEHIND POWERWingard rises above three Fremantle players to take a killer mark. He takes the set shot on goal 45m out and he floats it away for a point. 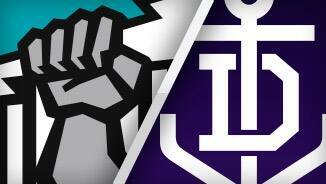 The Power are full of run, with the Dockers needing to curb them, if they are to win the four points today. GOAL POWERWhite runs onto the ball, he has a running shot on goal and he splits the middle. THE POWER ARE IN FRONT! SUBSTITUTION POWERThe Power have activated Young into the game at the expense of Renouf. We are under way for the final term. THREE QUARTER TIMEThe Power win the term to reduce the margin to five points in favour of the Dockers at the final break. The Power clear it away from defence, with still enough time for them to score another goal and take the lead before the final break. Dockers InterchangeChris Mayne off due to an injury. Power InterchangeHamish Hartlett off due to an injury. And the Dockers are back in the hunt. Dockers InterchangeNicholas Suban off due to an injury. Dockers InterchangeCameron Sutcliffe off due to an injury. Dockers InterchangeDanyle Pearce off due to an injury. Welcome to Adelaide Oval for the Port Adelaide v Fremantle Round 8 clash. PORT Adelaide's now famous last-quarter run has seen the Power grab top spot on the ladder with an 18-point win over Fremantle at Adelaide Oval on Saturday afternoon. A dynamic Chad Wingard was the game-breaker as Port triumphed 13.16 (94) to 11.10 (76). Port banked its seventh victory from eight games - its best-ever start to a season. The Power trailed by five points at three-quarter time but produced a customary fast finish which floored the Dockers. Wingard kept the Power in the contest with his uncanny goal-kicking before the home side steamrolled Fremantle with five goals to two in the final term. A goal to Matt White in the first two minutes of the final quarter wrested back the lead for the Power for the first time since early in the second term. In that second quarter the Dockers kicked five goals to two, giving them a 10-point lead at the main break after trailing by seven points at quarter-time. White's second for the final term, after a string of Port behinds, stretched the margin to 10 points, and that goal was followed quickly by another to defender Jasper Pittard. When Wingard kicked his fifth half way through the last quarter, the match was effectively over. 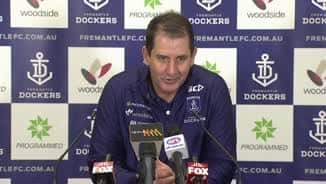 Dockers coach Ross Lyon tipped his hat to the Power's ability to secure the game when it was there for the taking, but lamented his side's missed opportunities. "I thought we clawed it back pretty well, even had some opportunities late that we muffed to be frank," Lyon said. "Fluctuating fortunes, there were times they were in control, [times] when we were in control but the bottom line is this, when the last quarter of the game was up for grabs they dominated ground ball and it was 10 [forward 50] entries to one." 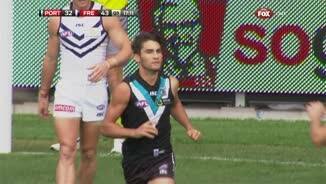 The third term had been a seesawing battle, with the Power managing four goals – three of them to Wingard - to Fremantle's three. Port midfielders Ollie Wines (27 disposals), Robbie Gray (30 touches), Travis Boak (29 possessions) and backman Jasper Pittard were prominent. Fremantle goalsneak Matt De Boer booted three goals, all in the first half - a return matched by versatile Zac Clarke. And Freo onballers Nat Fyfe (34 disposals, two goals), David Mundy (31 possessions) and Lachie Neale (28 touches) were influential. 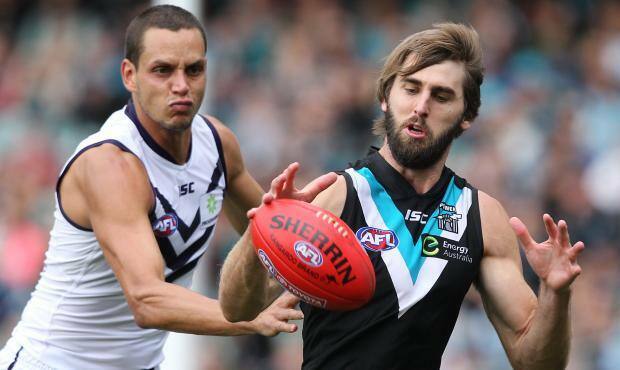 But the Dockers lost Stephen Hill to a left knee injury, the playmaker substituted early in the third quarter as his injury-troubled season continued. 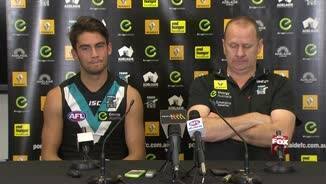 Port Adelaide coach Ken Hinkley took a trademark measured approach to his side's superb 7-1 start to the year, saying the Power had been "solid". "We've played good footy, there's no doubt we've played strong footy right through," Hinkley said. "No coach would sit here and tell you we've played perfect footy, we've played enough solid football that we are where we are and we deserve that right now."